Echoes of the troubadour’s song can still be heard across the lands of Oc, ringing in the silence and the song of the nightingale, in the melody of flowing springs and sometimes a chanson from a modern minstrel. Since the beginning of time, the music of nature and of muse wove a spell that sustained the harmonious patterns across the landscape and between earth and heaven. Enchantments woven by the troubadour poetry and songs nourished the land and all its creatures. The quest for the grail, the return of beauty and the elevation of the feminine arose out of a deep longing held within the heart of the people and troubadours carried this impulse between medieval chateaux, mountain fortresses and across the land. Troubadours were also messengers carrying news and keeping alive the network of secret factions, such as the Templars, Cathars, and Gnostic groups. The word troubadour comes from the root word trouver in French and trobar in Occitaine, meaning one who finds or discovers and also one who invents. We can also look at the word troubadour as trouba d’or, or finder of gold, as in alchemical transmutation of dross matter into perfection. Harmonious chords can change the dissonant noise of life into beauty. Music contains the seeds of perfection in its proportions and harmonics, which are also found in the architecture of ancient temples and medieval Gothic cathedral construction. Troubadours can be seen as the ones who are recovering the seeds of truth, flowering into the songs which stretch our minds and hearts, and weaving a new cultural matrix for a new era. “Whatever the gods do, they do by song…things are summoned by this praise song and encouraged to come joyfully into being.”? 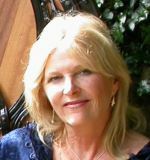 For several decades, I have been a questing troubadour journeying in many lands of the world and learning from the ancient cultures, from the people and through observing nature. I found a shared thread of wisdom and knowledge that streams like a river, connecting like tributaries, all religions and ancient traditions. The job of the troubadour is to strive to bring these essences alive in stories and songs to reawaken the magic and mystery of life, re-enchanting our world. The following accounts are a few fragments of this harper’s journey through the ancient sites of the Land of Oc. once more a theme of vital importance…”? In the summer of 1987 I visited Southern France for the first time and spent three weeks in a friend’s family farmhouse in Cahors in the region of Lot, site of a medieval Templar commanderie, (center of command). At that time, I had never heard of Templars or Cathars and was a traveling troubadour, making my way from South America and Britain, on to Egypt. During that short stay I sang to Black Madonnas, serenaded the stones in Neolithic circles and huts and explored the wonders of the beauty inside the earth in Magdalenian era grottos, floating down their underground rivers. I was not yet aware of the tragic history of the many so-called heretical groups who had inhabited this region. And yet the imprint of timeless layers of poignant stories remained that I found entirely overwhelming. That was the beginning of a long quest for threads of truth and wisdom resonating in Southern France and the sacred covenant that was formed by a people’s love of freedom and freedom to love. The various groups who have resided in this southern region of the Languedoc have perennially been labeled heretics: Cathars, Templars, Jewish refugees, Moors, Kabbalists, Gnostics, Troubadours and more. The etymology of the word heretic, or hérétique in French, is from the Greek hairetikos, ‘able to choose’. These groups were all labeled as heretics and yet, they were the ones who chose to be true to their authentic path, unwilling to compromise their values and succumb to the agendas of the ruling kings or the Church of Rome. Perhaps it is for this reason that so many people are drawn to study and understand these groups today. We all hunger for freedom in a world that has become severely incapacitated by its fascination with material success and power. The Languedoc has always been a refuge for the rebellious and the free-spirited. Throughout history, the quest for beauty, love and truth has struggled to survive amidst the quest for dominance and greed. During the medieval era, the dominant powers of church and state burned the Templars, they burned countless thousands of Cathars, they burned Joan of Arc, who tried to liberate her people from foreign rule. They even tried to ban the poetry and songs of the Troubadours and silence the voices of women. But the spirit of truth would not be silenced and rose again and again, from the dust and ashes, rising from the half remembered promise patterned in the blood, held in the heart. Always they return, with the flame of hope for a better world filled with compassion, beauty and a song of love returning to the land. Not only do we return, but we are stronger. Out of struggle and adversity, we give birth to something greater, more passion to adhere to our truth. Depth of soul can be born out of times of challenge and it is through the fight for survival that one is seasoned and ripened beyond what could have occurred in an environment of ease and docile comfort. The beginning of the first and second millennia were turning points, times of great change and chaos, such as our current entry into a new millennium, a New Earth and a return to Beauty. After reading ‘The Treasure of Montsegur’ in 2007, I felt a strong impulse to visit the Sabartez caves and nearby chateaux said to be connected with the Cathars and with the grail mysteries. The Sabartez region is a narrow valley of the Pyrenees with the Ariege River cascading abundant clear waters from the mountains above. The high walls of the canyon host voluminous caverns, some reaching ten kilometers or more in length. My intention was to somehow find the caves mentioned by Walter Birks and Antonin Gadal, but finding accommodation for that night was first on the list. I parked the rental car in the little village of Ussat les Bains. Even the name of the village is fascinating, as numerous thermal spas in the region were developed by the Romans during the first and second centuries CE, during which time Romans practiced adoration of Isis. Often there are clues to be found in the old names of sites and Ussat is phonetically similar to Ausset, Iset, her Egyptian name. The Coptic word for her is Usat and the Greco-Romans called her Isis. As I walked through the village looking for a nice Chambre d’Hote, I came to a strange sign posted, ‘Maison de Flutes de Pan’. Not only did the place offer cheap rooms, but the owner apparently was a musician. I had heard Panpipes in the Andes, but not in the Pyrenees! Intrigued, I knocked on the door and Christian Koenig answered, a tall man with a deep and intense gaze, and it felt as if I was meeting a familiar old friend. With my scant French, about equal to his English skills, we discovered within the first ten minutes that we both played numerous instruments, including the troubadour harp. I was excited to learn that Christian was an expert in medieval Cathar and troubadour ‘chansons’. Through the universal language of music and after exchanging several songs, we agreed that he would guide me to a Cathar initiation cave that afternoon. I did not know at that time that Christian had inherited some of the texts and artifacts from Antonin Gadal, a man who was born in Ussat les Bains and dedicated his life to the study of the Cathars and the caves in the region. Certainly I had knocked on the right door! Two images were impressed on my memory from that first meeting. In the stairway of Christian’s home was a large pentagram carved in stone. I was to learn the following day that the Cathar initiation cave called Bethlehem is located on the hill directly opposite his home. 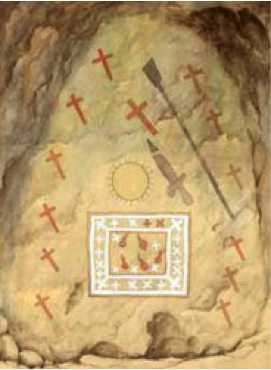 Within the small double exit cave is a pentagonal shaped recess in the wall, just large enough for a human body with legs and arms extended to form a pentagram, similar to Da Vinci’s Vitruvian Man or the alchemical image of the perfected human. Also within the cave is a large rectangular altar stone, or sun stone, thought to have been used by ancient Celtic and Mithraic sun worshipping traditions. Several have been found in the Pyrenees region; one that I had visited is near Saint Michel de Cuxa near Mount Canigou and the other is at Rennes-le-Chateau. The pentagram I noticed that day was the first of many to be discovered in the French churches and carved in the stones, and seemed to relate to an ancient stream of Hermetic knowledge that emerges in Templar, Cathar, Gnostic and Grail traditions. The pentagram is a shape associated with perfection, harmony, music and beauty. The Cathars called themselves The Pure and their priests traveled in pairs, living a life of fasting and prayer. They ministered to the poor and healed the sick and sang in the ancient languages, continuing the traditions and practices of the first Christians, Essenes and Nazareans. Cathar priests were both male and female and called Parfaits or Perfects. In Jean Markale’s book ‘The Grail’, he relates the quest for the grail in Wolfram von Eschenbach’s epic ‘Parzival’ to the “Purity that leads to perfection, the supreme goal of Catharism.”? He continues that the grail ritual in Parzival is essentially Cathar and concerns an alchemical goal to “…disengage the divine essence that sleeps in the heart of matter. This is pure Catharism.”? The second thing in Christian’s home that intrigued me was the bible over the fireplace opened to the Gospel of John, which begins, “In the beginning was the word,”? the sound of creation. This is the gospel which was used almost exclusively by the Cathars. Above the bible was a piece of art portraying the resurrection mysteries and a caduceus within the Christed human. (A caduceus is the ‘herald’s staff’ carried by Hermes and is depicted with two entwined serpents and wings. This image was used in ancient alchemy and is still the modern symbol for medicine and healing). The Hermetic science of resurrection combining sacred music and Eastern purification practices used by ancient Gnostics would become a central theme in my continuing quest and research. I returned at the appointed hour for the promised visit to the grotto, but Christian was not yet finished with his day’s work and the hours dragged on until it was twilight and soon to be very dark. I was quite concerned about navigating the mountain paths at night, not to mention the unknown twists and turns of a large cave. Finally he appeared with two miner’s headlamps and said, ‘Okay, let’s go’. What did I get myself into this time? Yes, I had wanted to visit the Cathar initiation cave, but this was turning out to be my own initiation. I tried to walk without the headlamp bouncing too wildly, trying to focus the limited light on the narrow and steep path. As we ascended the mountain, keeping the light focused on the path became a metaphor for my life. I had always walked a razors edge, choosing adventure over comfort as a modern troubadour. But more than once the quest took me dangerously close to the limits of human endurance. Once inside the enormous cavern, we turned off our head lamps and were immersed in total darkness. I began seeing strange lights moving and had a strong feeling that we were not alone. 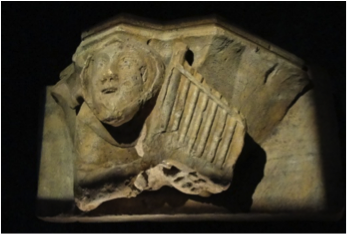 Christian played an old Cathar melody on his panpipes which was haunting and with the expanded acoustics of the large grotto, the song seemed to open a door between dimensions of time. Then I played and sang the Aramaic Lord’s Prayer and again sensed the spirit of the place and the people who had made this a place a refuge grow more present and palpable. Aramaic was called the language of the angels and was spoken by Jesus and his followers, and most likely by Cathars when saying this ancient prayer. A phrase kept singing within me during that experience in the dark cave, “Heart of the dove, the way of love.”? Perhaps like Saint John says in his gospel, Lux lucet in tenebris, ‘the light shines in the darkness’. “Penetrate to the caves for in the cave you will find the secret of a brotherhood…He would have to work in the dark with only the light of his own spirit…Treasure lies in wisdom and love, remember.”? Sept. 29 1937 message from White Eagle through Grace Cook, ‘The Treasure of Montsegur’, Walter Birks and R. A. Gilbert. 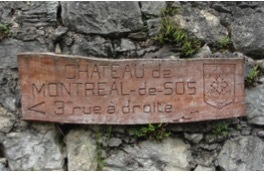 On a subsequent visit to the Ariege and Ussat les Bains, Christian suggested that we visit the ruins of Montreal de Sos, a ‘Grail Castle’. The valley of Vicdessos is Southwest of Tarascon sur Ariege and leads into the Pyrenees; there is still a path at the end of the valley in use for thousands of years that is traveled by modern pilgrims as well as smugglers passing between Spain and France. 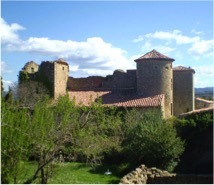 The fortification chateau Montreal de Sos was built in the 12th century within the region and rule of Raymond-Roger, Count of Foix. The Count was sympathetic to the Templar and Cathar cause and his wife ultimately became a member of the Cathar church. Raymond’s sister was Esclarmonde, meaning light of the world and one of the greatest Cathar priests. 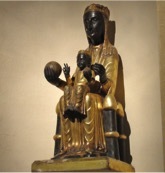 She was responsible for the rebuilding of Montsegur and records tell us that she received the Cathar sacrament, the consolamentum to become a Parfait or Perfect in 1204 AD. In a local legend, it is said that Esclarmonde took the form of a dove in order to carry the Holy Grail to safety during the Cathar persecution at Montsegur. After climbing to the top of the ruins on my first visit to Montsegur, I felt the presence of a great white bird wrapping its wings around our small circle of pilgrims as we were chanting softly….perhaps an imprinted memory held within the stones of the chateau. Driving to Montreal de Sos through the narrow winding valley road from Tarascon sur Ariege toward Vicdessos, the opening to the extensive caverns of Niaux can be seen on the left. 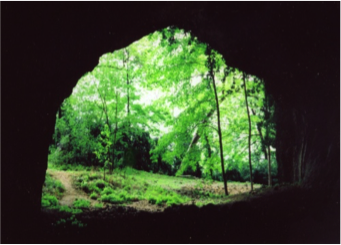 Niaux is a Paleolithic era cavern that hosts paintings of bison, horses, auroch, ibex and fish, more than twelve thousand years old. One passes the medieval chateau ruins of Miglos and the nearby Neolithic dolmen called Sem. (Interestingly, Sem was the name of the Egyptian priests who performed rituals to Osiris and also one of the sons of Noah). What is in a name? If one looks at the etymology of names of ancient places, especially in areas that host a concentrated number of sacred sites, the name can provide clues about the nature of the place. The phonetic resonance of a word tends to carry more meaning than just the spelling, as this can change dramatically in a short time. The sound of a name can also identify essential qualities of the thing or place named. “Mithraic liturgy contained magical formulas held to be ‘root-sounds’…every object is related to a subtle sound which, when uttered, can destroy, modify or bring into being the corresponding object.”? One of my Tibetan teachers once said that in a language predating Sanskrit, Hebrew, Sumerian and Egyptian languages, there was no separation between the sound and the root resonance of that which it referred to. (This reminds us of modern physics and string theory). When a word was uttered, the material or state which related to that resonance was called forth. This is the same science practiced in the relationship between a mantra (a combination of bija seed syllables) and its corresponding shape or design, called in Sanskrit, yantra. 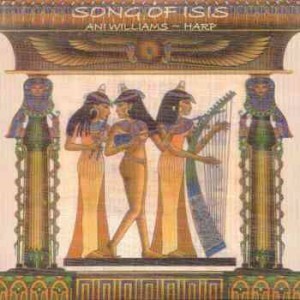 This sound science was practiced by Thoth-Hermes and Isis, both of whom ruled over Egyptian temple music and chant. From the base of the medieval chateau of Montreal, the easiest access is through one of the short passage caves that open just below the fortification. On the day that Christian Koenig and I arrived, there was an archeological excavation in process. I asked what sorts of things they were finding and the men replied that there were pottery fragments, various knight’s gear, and coins dating to the medieval era, when the Knights Templar were active in this region. Deodat Roche, considered to be the last Cathar ‘pope’, believed the most important site for the Cathars was Montreal de Sos and compared it to the grail castle Montsalvash (Mount Salvation) mentioned in Wolfram’s ‘Parzival’. 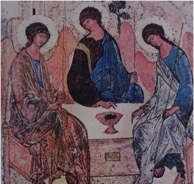 When Roche was shown a painting of the scene depicted on the cave wall of Montreal, he recognized it as being identical with an illustration found in a manuscript of the 13th c. ‘La Queste del Saint Graal’ edited by Albert Pauphilet (Paris, 1923). 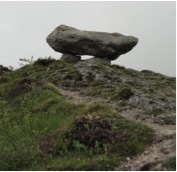 Interestingly, there is a triangular alignment in the Vicdessos valley formed between the ruins of Montreal de Sos, the Neolithic dolmen Sem and a peak named Col de Grail.